The problem with California is that it’s just so beautiful. And sunny. All the time. Of course, that’s why it’s known as “sunny California.” Apparently, though, winter is the rainy season. You wouldn’t know it from being here, though. The state is experiencing its longest drought in more than 100 years. And that’s a bad thing for food prices and availability for everyone in America, since California grows a lot of our food—both the organic and the chemical, “conventional,” kind. People are starting to get worried, especially the farmers. Many are blaming global warming, and I am sure there is truth in that. I am in no way a denier. However, global warming is an esoteric, ephemeral idea made up of a million practical things that we have control over. Let’s start with the good news: I didn’t see a lot of rampant water waste in California. The only truly green lawn I saw was the Pebble Beach Golf Course (I’ll give them a pass—it’s their job, and it was gorgeous!). All the showerheads and toilets seemed very efficient. And because the weather is so “nice,” there doesn’t seem to be a lot of wasted energy on heating and air-conditioning. I’ll tell you what the problem is in California. I saw it with my own eyes, and it shocked and concerned me greatly. I drove from San Francisco up to Sacramento to give a talk. It’s about a 2.5-hour drive. And yes, I thought it was weird that there were six-lane highways from what seemed like a small town to the next small town, but that wasn’t what shocked me the most. It was the farm fields. Other than the Central Coast of California, the land north of San Francisco is some of the most productive and abundant farmland in America. It was January when I drove though, so I know the fields were mostly dormant and being “prepared” for planting, but that did not prepare me for their utter NAKEDNESS. Not only were there no weeds or wild plants (even at the edges) but there were no cover crops, no mulches, no PROTECTION for the soil, either. 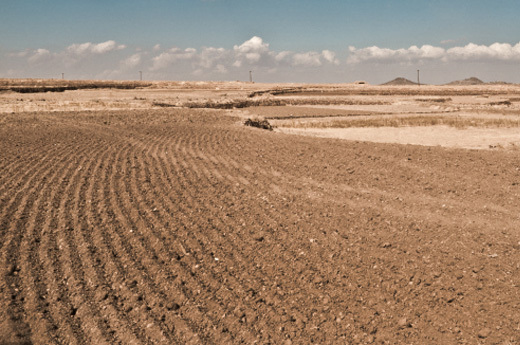 The soil was dry and barren—a dust bowl just waiting to happen! In fact, most of the fields were freshly tilled, which is also a recipe for disaster when it comes to preserving moisture and soil life. It leaves nothing left to absorb and store the carbon that we need in the ground to remedy our climate-change problem, let alone enough to manage a farm practically for the long-term health of its soil! Even the orchards, of which there were many, were stripped clean of any additional life other than the dormant trees with their coated white trunks. There were no ground covers of wildflowers to attract native pollinators; no, these are the orchards where hives are trucked in when needed so the bees can pollinate for a price, get poisoned by the pesticides, and then die off at an unnatural rate. And before you get excited about farmland being naked, it’s not that kind of naked. No, it was a body without skin sort of naked. It’s a naked that is exposed to disease, damage, and degradation. Some may call that “conventional” agriculture. I call it abuse. Right smack in the middle of this drive is the University of California–Davis, a school I have always heard about as a leader in sustainable agriculture. It all made me sad. Later that week, I attended the Ecofarm conference in Pacific Grove and had a chance to ask a California rancher if what I’d seen was in fact what I thought I saw. “Yes, and that’s 95 percent of California agriculture,” he said. At the conference I was asked to sit in on a roundtable of Women in Agriculture. As you all know, I am not a farmer, so I just listened as each woman spoke and explained why she was there. There were about 60 woman involved with all different types of farming, and they each told a variation of a similar theme: They love what they do. They love the earth and its wildness. They are frustrated by the challenges they face with the male view of how things should be done. One farmer spoke about hearing multiple stories from female “WWOOFERS” of being sexually abused. When it was my turn to speak, I said that I believe that how we treat women is how we treat the earth—we being the collective we, both men and women. So what is the drought telling California? It’s time to change, to adapt, to take better care of nature’s body. That same rancher talked about weeds not being the problem but a symptom of the problem. In the same way global warming/climate change and drought are not the problem here but a symptom of the problem. And the problem is we are treating the earth as if the future doesn’t matter. Or worse, searching for a technological solution that people can get rich from, as if nothing mattered except an economic indicator that doesn’t even reflect any honest truth. The answers are out there. In fact, the answers are right in front of our faces and underneath our feet. And they are simple. All the evidence of what we need to do already exists and has been verified by scientists around the world, including the UN. All that’s left to do is help open the hearts and minds of those farmers and academics who haven’t been able to see it yet. Sometimes it’s hard to see things from a different perspective when you’re stuck inside an old familiar one…even if it doesn’t work anymore. Until, perhaps, something happens that forces change. And then everyone has a choice: Choose life, and embrace a different path, or choose death, and stubbornly cling to the old path. Ecofarm made me hopeful. There are so many successful organic farmers, and so many new, young ones—many of them women! But like taking over a farm that’s been degraded and damaged, there is a lot of hard work ahead of them. And only one way to heal the earth: organically! Thank you for talking about the earth in terms of the body and nakedness: “No, it was a body without skin sort of naked … exposed to disease, damage, and degradation.” The vulnerability invoked in this way reminds me of writing done by Terry Tempest Williams or Gretel Ehrlich. We need to think more about the “skin” of everything around us. A great recap of what it is really like when driving through northern California. We might read about the progress that’s being made in organic and sustainable agriculture but that drive alone is a dramatic reminder that widespread change has not yet occurred. I too was in attendance at the workshop for women at Eco Farm and left feeling rejuvenated and supported by my fellow females who are out there fighting for a food industry they believe in, supplied by environmentally friendly agricultural practices. It’s up to us to make the change and I believe wholeheartedly we are making progress. Thank you for this additional information, Maria. I hope there are enough of us out there who will speak out in support of our Earth. Many of us are trying to fight to stop the Keystone pipeline from being completed. Just as the “old ways” of treating the farmland is ruining our earth, so too this pipeline will ruin land, water and our air, making the already too hot climate change so bad we won’t be able to stop the destruction of our world. Let’s hope we all wake up before it’s too late. Especially those who are making these decisions for us. I farm organically just north of that stretch of I-80 you drove along, and I hate to tell you this, but your one-time observation of this area in the winter led you to all kinds of incorrect conclusions. There hasn’t been enough rain here this winter to sprout a cover crop, nor to sprout the thousands of acres of wheat that is the traditional winter crop rotation for most conventional growers. The orchards are not bare by the choice of the people farming them, by rather due to the lack of rain. Plants do not grow without rain, and we have had less than an inch in two months. This area normally gets 25 inches of rain annually, and it is normally lush and green all winter. Sure, there are lots of fallow fields in the winter, but those fields are normally soaking up millions of gallons of water and percolating it into the soil below. Run off is collected in ponds at the edges of the fields, where it serves as habitat for critters. Blaming farmers for drought is blaming the victim, pure and simple. Farmers and their employees are the only people who are going to suffer real economic harm due to this drought. Your post is clueless and totally disrespectful. Paul Underhill, Thank you for taking the time to write your comment. We can all observe the same thing, but the lens we have derives the meaning to what we see. Now we have a view through another lens, and a different meaning. For your area of California, is the drought a lack of rain in the same area as you farm or it is also a lack of rain in the area where you might get irrigation water. It doesn’t sound like that, but I was curious. This drought is very serious, and we are all very concerned. I hope you are able to make through this and continue farming. To get what you want, STOP doing what isn’t working, and anything un-attempted remains impossible! Thank you Mr. Underhill for your point-of-view. There is usually another side to every story. We must consider them all. thank you maria for your direct and to the point perspective. I grew up and live on the Sonoma Marin Coast and went to UC Davis where I rescued wild raptors at the UC Davis Raptor Center which sits amidst the very lands your are speaking. while indeed we are experiencing an extreme drought, Californian’s are not inexperienced at it. Drought comes and drought goes. this is a bad drought. My partner and i have 150 head of sheep and we live in the heart of dairy land. its a big deal,this drought. and it is not the problem, its part of life here in CA. While I see what Paul is trying to say, I hope that readers take what Maria is saying seriously here. Paul in his attempt to defend actually contributed to Maria’s point. we really don’t take good care of our soil here in CA. To have mass acreage of barren, well tilled earth sitting, waiting for a drop of rain or irrigation, is indeed outdated, drought or no drought. there are so many other options and ways to treat the soil and the AG lands up 80 and all the way down to Southern California, look barren half the year because of old, outdated practices. Along with AG people needing to get educated and open to new (or shall we say ancient) ways of farming, so does the public need to accept and encourage fruit and veggies that are not perfectly shaped, that may have a few blemishes and fields that look a bit more wild, and thus scruffy as opposed to the perfectly tilled, barren field and way-too-perfect looking food in SUPERmarkets. Perhaps if we consider Maria’s analogy that we treat our soil, our earth’s abundance like we treat women (or better yet how we interface at a social level where our value system is based on our outer appearance), like a trophy, something that should look pretty on the outside. emphasis on appearance and symmetrical beauty, well put together attire and hair and make up. all of which become part of our over consumeristic habits to get the next fashion–driven towards women purchasers–which further rapes the earth’s surface and pollutes her soil, waters, our lungs and guts with plastic, nylon, flame retardant toxins. i could go on…i believe we can change our trajectory if we start to take responsibility for our out of balance consumerism, social values, etc. if we can connect people to the farmers and ranchers who grow the food, perhaps each can influence the other and encourage new practices from farm to table. Some of us can focus on regenerating soils, some of us can focus on reducing our consumerism and some of us can educate the public about healthy living, etc and so on. I concur with Ariana. In addition to the growing side of things, we need to continue encouraging retailers to increase their efforts for educating the end-consumer. Shoppers at supermarkets, farmers markets, etc. need to better understand where their food comes as well as eradicate their perception that produce needs to be seemingly perfect to eat.